Part of our designer series, professionally decorated in a sophisticated rustic style 13 Crows has it all. This cabin is secluded on 4 acres and no other cabins in sight. 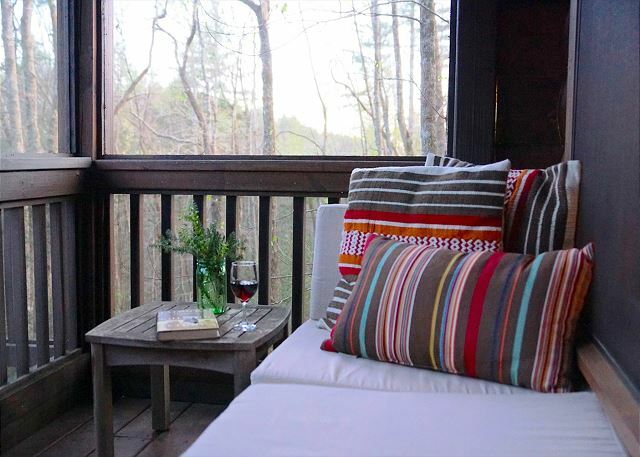 With seasonal ridge views and perched over Amy Creek in Ellijay, GA you can hike the woodland setting without leaving the property. An oasis of calm greets you at every turn. This little gem has all the amenities you could ask for, and then some. Propane log fireplace, Wifi, Ipod docking station, Flat screen TV in the living Room and Flat screen TV in bedroom. Propane grill, large hot tub, 2 firepits ( 1 at cabin & 1 at creek), hammock, gated front porch, secure back deck & screened porch. Small fenced area for the dog under the deck. 1 bedroom (Queen bed) 1 bath. This cabin is adult only. (No guests under the age of 25). No cats please.